Providing you the best range of surface aerator, clarifier scrapper, agitator, floating type surface aerator, mixer settler and floating surface aerator with effective & timely delivery. PP Aquatech aerators outlast other aerators 2 to 1. On poorly maintained aerators, pp Aquatech aerators outlast other aerators by more than a 3 to 1 margin. Scheduled maintenance consists only of motor bearing lubrication 2-4 times per year, depending on motor size live 1.5 kw to 25 kw. 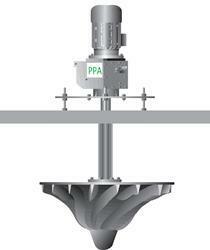 The PP aqua Surface Aerator has the best mixing capability of any vertical shaft surface aerator. Due to the unique blade design, the impeller induces a strong axial flow pattern which ‘pumps’ oxygen-deficient water up from the tank floor and forces it out to the tank sides. This strong, deep circulation improves oxygen transfer and mixing throughout the tank. 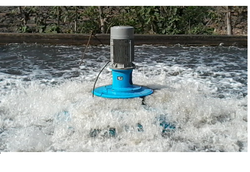 This action is superior to the surface radial flow pattern created by most other similar vertical shaft surface aerators, which provides little dissolved oxygen and mixing at depth. This advantage gives Vertex aerators efficiency gains of up to 30% in clean water tests compared to others. The efficiency of PP Aquatech is maintained for the full lifetime of the aerator, often up to 10 years. This makes their whole life cost efficiency compare favorably with other aeration technologies such as Fine Bubble Diffused Air, which always show a decline in efficiency over time and require new diffuser membranes to regain their efficiency. We guarantee a Standard Aeration Efficiency (SAE) of 2.25 kgO2/kWh on most of our proposals; however, independent tests have shown results of up to 2.75 kgO2/kWh. The design of PP Aquatech is such that both radial and axial forces are much lower than with conventional surface aerators. This has many advantages – primarily that the forces and vibration on the gearbox bearings and mounting structure are significantly lower. The design and the shape of the blades is such that it is virtually impossible for rag or other detritus to attach to the impeller. All maintenance items are accessible from the mounting platform, and maintenance is limited to an annual oil check (2 years with synthetic oil) and periodic checking of greasing points. Depending on circumstances, it is possible for a single PP Aqua aerator to transfer anything from 1 to 500 kg Oh into water. Their Standard Aeration Efficiency (SAE) is near-constant over a wide range of speeds and immersion depths. 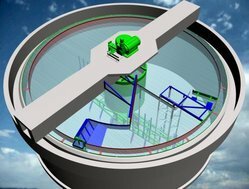 PP Aquatech can be installed in a fixed or floating configuration in virtually any tank from 2 – 6 m depth: aeration tanks, bio reactors, oxidation ditches, SBRs, lagoons, balance tanks and sludge tanks. 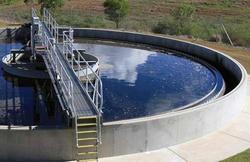 They maintain high efficiency in a wide range of wastewater, effluent and clean water applications. Bridge:- Main bridge, spanning the full diameter of the tank , will be made out of truss type fabricated M.S. structures and shall have a minimum width of 1000 mm. It shall be firmly anchored onto the RCC tank. Two more truss type structures, at 90 degrees to the bridge on either side and having a minimum width of 300 mm will be provided to span the tank fully. These also will be anchored to the RCC tank. These structures help in supporting the detention hood and draft tube and also take the operating load of the drives. The bridge will be spliced for transportation. - Walkway from one end of the tank to the drive center and two meters beyond shall be provided, made of 5 mm thick chequered plates. Access ladder within the bridge to the walkway, to the impeller drive at the center and walkway around the impeller drive shall be provided. - Hand railings, 1 meter tall, made of 32 NB / 25 NB, B class pipes will cover the full walkway. Will be spliced for transportation. - Scraper accessories: Drive system. - Our A type drive head, worm gear type, with a continuous operating torque of 2,000 to 35,000 foot pounds. Receiving sprocket (driven) on the input shaft. Chain guard over both the drives. - Premium make / your choice of worm reduction gear box with simplex drive sprocket on the output end driving the driven sprocket on the drive head through chain. Lovejoy coupling on the input shaft. - Crompton make / your choice of motor coupled to the reduction gear. - Scraper speed at the rake arm tip will be 2500 mm / minute. 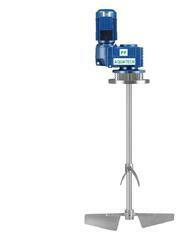 - Vertical shaft top piece suspended from the drive head, made of EN 8 / 9 round bar of with flange at the bottom. A set of heavy duty ball bearings will firmly hold the shaft and will be placed within the height of the bridge. 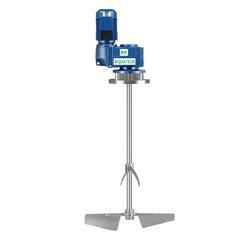 - An intermediate vertical shaft, also made of solid round with both end flanges in place. - Bottom stub shaft of heavy duty class pipe and arm support fittings. - Two scraper arms of MS truss type construction at 180 degrees to each other. The blades will be bolted to the arms. 26 gauge Brass / Rubber squeezees with hold-down plates will be provided. Will be spliced for transportation. Two stub arms and four cross bracings will be provided. We are fabricationg suppliying of Agitator to our client in SS and MS.
Our Modular Mixer-Settler is fabricated and assembled in a compact modular design. The mixer, as well as the settler, is both integrated together instead of being separate entities. We Offer fabricate , manufacture & supply of Solid Contact Clarified to our client.